Mason Dyslin paced the Brewers with 11 points, and he added six rebounds. 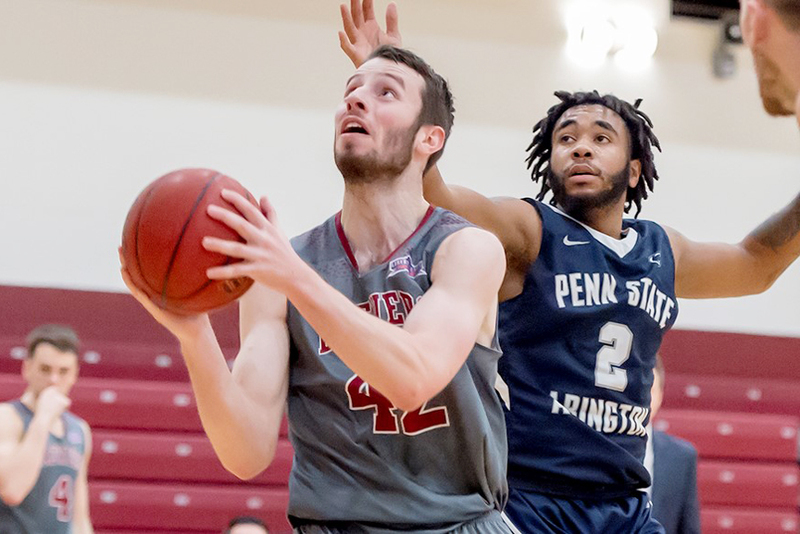 POUGHKEEPSIE – The Vassar College men’s basketball team concluded its seven-game homestand with a matchup against Clarkson on Saturday afternoon. Looking for their second straight win after defeating St. Lawrence on Friday night, the Brewers (8-11, 4-8 Liberty) fell to the Golden Knights (4-13, 3-7 Liberty) by an 80-55 count at the Athletic & Fitness Center. Vassar jumped out to a 9-2 lead after five minutes and held a 15-8 advantage after Chris Gallivan’s trey midway through the opening half. After a pair of Clarkson baskets, Hugh Durham drained a three-pointer to make it 18-12 in favor of the Brewers with 8:23 left until halftime. The Golden Knights responded with a 13-0 run, however, to open up a seven-point lead, 25-18, and Clarkson held a 39-26 cushion at the break. Clarkson extended its advantage to 44-28 early in the second half before Vassar rattled off 11 straight points to get back within five, 44-39. It would get no closer, though, as the Golden Knights sank a trey on three of their next four possessions to bring the lead back to 14 points, 55-41. Clarkson pulled away for an 80-55 victory to complete a season sweep of the Brewers. Mason Dyslin paced the Brewers with 11 points, and he added six rebounds. Zach Bromfeld registered 10 points and seven boards, while Lance Tebay collected nine points. Vassar shot 37.2 percent (16-of-43) from the floor, 26.1 percent (6-of-23) from three-point land, and 70.8 percent (17-of-24) at the free throw line. Five Golden Knights scored in double-figures, led by Matthew Hornak’s 17 points. He also tallied five rebounds and three assists. Liam Ellis finished with 14 points, five boards, five assists and four steals, while Matt Higgins and Roburt Welch had 13 points apiece. Chris Hulbert contributed 12 points to go along with a game-high eight rebounds, as Clarkson held a 33-32 edge on the glass. The Golden Knights shot 48.3 percent (29-of-60) from the field, 42.9 percent (15-of-35) from long range, and 63.6 percent (7-of-11) at the charity stripe. After playing seven straight at home, the Brewers begin a four-game road trip with a 7 p.m. matchup at Bard (10-8, 6-5 Liberty) on Friday night.